I really, really wish Apple doubled down on Siri. When the intelligent personal assistant debuted as an iPhone 4S-exclusive back in October 2011, Siri was likened to a seismic shift that would vastly improve our interactions with the devices in our lives. And it did. 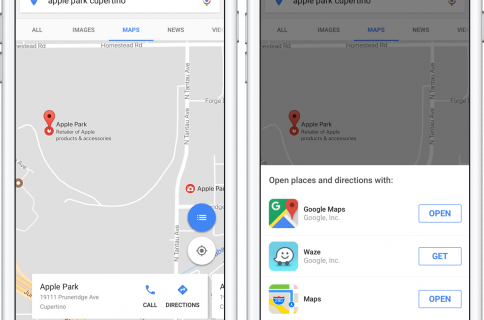 But merely nineteen months later, Google has leapfrogged Siri with Google Now, which combines the power of Google search with the company’s Knowledge Graph and top-notch voice recognition to deliver relevant info before you even asked for it. 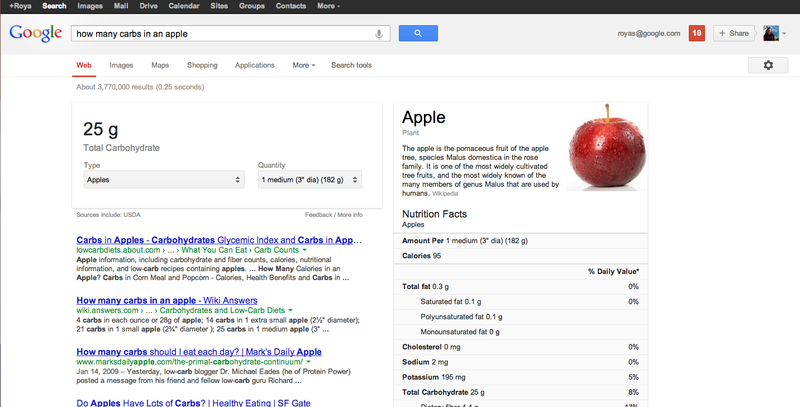 While today’s refresh of Google’s native iOS Search app is just a maintenance update, a far more interesting development is the roll-out of nutritional information in search results on the web and in Google’s native search apps on iOS and Android. You’ll be able to ask Google questions like “How much protein is in a banana?” or “How many calories are in an avocado?” and get the answer right away, presented via a nicely laid out information card. Depicted below are two such examples. Banana protein data on the left and nutritional information on the right. Of course, you’ll also be able to retrieve nutritional information on Google.com, by typing in your query or using your voice (see the below image), thanks to the latest Chrome browser update that incorporates Siri-like conversational voice search. Tapping the power of Google’s Knowledge Graph which brings together bits and pieces of information that weren’t easily accessible, the system can even distinguish between foods that have a completely different sounding name. Case in point: asking for “summer squash carbs” will include “zucchini” as a relevant food in the dropdown menu, because it is a type of summer squash. Other types of nutritional-related queries include questions such as “How many calories are in popcorn?”, “What nutrients are in breadfruit?”, “Is there sugar in granadilla?”, “How many carbs in corn?” and so forth. Nutritional information in search results is rolling out gradually in English to U.S. users over the next ten days, so don’t panic if you’re unable to research your favorite foods yet. The Internet giant says it’s going to add more features, foods and languages in the coming weeks and months. I appreciate Apple enhancing Siri – it recently tweaked her to respond to longer queries with quotes on brevity – but there’s no denying that Google has the upper hand here and is moving at a faster pace. Just out of curiosity, do you prefer Google Now over Siri?